At the end of October, Douaumont had been recaptured. The next day French engineers examined the fort. They found there was much damage which, although serious and extensive, was largely superficial. The hammering it had undergone for months had not reduced it to rubble and the engineers considered that repair work could proceed with immediate effect. The worst aspect was clearing up the human refuse. The Germans had put in place a "Fort Commandant" whose terrible job was to put and keep discipline and organization into the huge rambling structure, through which came and went some 1-2000 men every day, to keep control of food, ammunition, water supplies (all of which had to be brought into the fort by the men), to evacuate the wounded and dispose of the dead. Constant and deadly shelling made access into and out of the fort very difficult and every man took his chance entering and leaving. Those whose luck ran out could not be buried and their remains littered the area. Cess pits were full to overflowing. Those who had died in the fort had been buried in quicklime, walled up in disused rooms and now had to be unearthed in their disintegrating state. Absolute general filth abounded. Internal access was difficult, since many passages were blocked by fallen masonry and some of the underground passages were flooded. It was said you could smell the fort a mile away! Volunteers were called for to clear up this huge rubbish heap?? ?.one wonders how many men "volunteered"? Fort Vaux fell on November 2nd after the Germans had abandoned it, blowing up the 75mm turret in the process and causing a lot of the damage that can still be seen today. The fort was found to be in an equivalent state to Ft.Douaumont and, again, repair work was instructed. Both forts had extra fortifications added into the ruins. The town of Verdun was nearly safe. The filthy, foul, cesspit of the battlefield became impossible for men to live in. But they did, on both sides. And still the battle wore on; more slowly now, since movement was almost impossible. There were a few last attempts to move the line forward, but now winter was in charge and finally, the appalling physical circumstances forced a halt on the battle. The men who survived it and who now garrisoned the wasteland, lived in the mud through the winter. During the winter, Hindenburg and Ludendorff instructed the building of the Hindenburg Line away to the East. This masterpiece of defensive construction shortened the German lines, allowed them to free some of their battered units for a very much needed refit, to bring others from the Eastern Front, and gave them a new front line against which they believed the BEF would expend itself in useless effort in 1917. As to how I got interested in the subject in the first place… well, when growing up in the Midlands and in London suburbia in the 1960s I was very conscious that my father’s and my grandfathers’ generations had fought in two world wars, and that my own might be engulfed in a third. But up to the age of about fourteen it was images of 1939-45 rather than 1914-18 that – through newsreel footage, television, books, and comic strips – dominated my understanding of what wars were like. 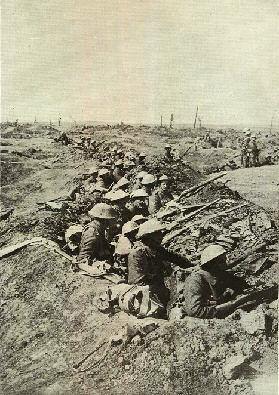 When I first borrowed a history of the Great War from the public library and realized that the Western Front got stalemated after the opening round of fighting and moved very little until the last few weeks, I can still remember my reaction: ‘Was that all that happened?’. Two influences changed that view (both of them rightly stressed in recent studies that have underlined how the 1960s marked a turning point in British perceptions of the war). 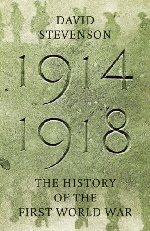 One was A. J. P. Taylor’s The First World War: an Illustrated History, which is still, I am delighted to see, a fixture on Penguin’s history list, and still published in a format identical to the inimitable original. My father bought me a copy when I was in hospital with a broken leg, which gave me the enforced leisure needed to read it. Taylor’s trenchant prose and his disabused world-view were revelations: as was his implication that what had happened before could happen again, and the next time with nuclear weapons. The second influence was the marathon twenty-six-episode BBC television series on The Great War, which I watched on its repeat showing. John Terraine’s and Correlli Barnett’s scripts, the elegaic mood music, and Michael Redgrave’s sombre narration created such memorable juxtapositions of words and atmosphere that many of them remained familiar when I next viewed the programmes more than thirty years later. Taylor and the BBC endowed the war with an intellectual and imaginative fascination that has never lost its grip. That fascination led on to me writing a doctoral thesis and five books. It also heightened my awareness of the living connection with the conflict through my mother’s father, John Howard Davies, who volunteered in 1914 and served in the Royal Welch Fusiliers and the South Wales Borderers. He became an officer and was twice wounded. He was a man of quiet dignity whom I greatly respected: his wife Enid, to whom he became engaged before his active service and whom he married after it, had equally painful recollections from the period, including of a false alarm that her fiancé was reported missing. I assume it is no accident that other recent writers on the war, such as Ian Beckett, Niall Ferguson, and Hew Strachan, also refer to grandfathers who fought in it. Personal memory – even at one remove – still lends the subject an immediacy and a self-evident importance that more distant historical events seem no longer to possess. I received email after last month's column on Flyboys, tasking me for my mostly positive review. I guess if Flyboys was titled "The True Story of the Lafayette Escadrille" I would have written a negative review. But, Flyboys does not set itself up as the true story of the Lafayette Escadrille. The title Flyboys is both whimsical and slightly derisive indicating to me that this is not a movie deeply concerned with more than a whiff of reality. And that's okay by me. After all, a movie is primarily just entertainment. Anything more is often secondary. Movies are both a visual art form and show business; and this inherent dichotomy allows for both filmmaking art and box office. As part of the nearly lost aviation genre of movies, Flyboys deals out the lyricism of flight, heroism and honor and sudden death in the air, and the tension and fatalism of combat and lost comrades. Flyboys is both a throwback and homage to that lost genre. When you consider the aviation genre films dealing with World War One, these major themes (and others) run through them all. Here's a partial chronological list of the major Great War aviation films. I've selected titles that have been officially released on VHS, laserdisc and DVD and those that can also be found on eBay in various formats. I've also included titles that air on Turner Classic Movies. As it happens, Flyboys did not do great box office here in the United States, grossing about $6 million. It might do better internationally. For those who missed it in the theaters, it's scheduled to be released on DVD in January 2007. This supplement can be downloaded independently of the Trip-Wire as an Adobe Acrobat PDF File so you can view it or print it out as a separate document. There will be no charge for this. Click here to download our Special Anniversary Supplement. This year marks the centenary of the launch of HMS Dreadnought, brainchild of Admiral Sir John Fisher and the ship whose name soon became synonymous with a new breed of battleships. Soon all the major naval powers - and some minor ones, too - were building or buying dreadnoughts, and the dreadnought race between Britain and Germany contributed to the growing tensions between these two nations. So what was it about Dreadnought that was so different? It wasn't her turbine engines; although these were considered a daring technical leap forward, several ships considered dreadnoughts would be powered by the older style reciprocating engines. Nor was it her armor protection, which was actually slightly inferior to that of her immediate predecessors, the Lord Nelson class. The one thing that set Dreadnought apart was her battery of ten 12-inch guns, of which eight could be fired on either broadside. 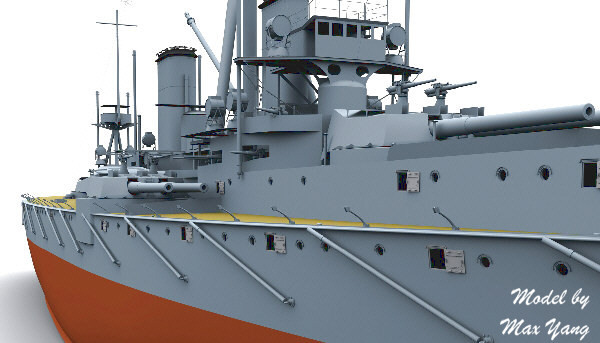 Previous battleships had featured a battery of four 12-inch guns supplemented by a number of smaller guns -- anything from 7-inch to 10-inch in caliber. As gunnery ranges grew longer, it became difficult to control these mixed batteries, since the guns differed in ballistic performance; moreover, it was hard for the officers controlling gunfire to distinguish the splash of, say, a 9.2-inch shell from a 12-inch shell, so making corrections could became confusing.